Eager to preserve a bit of early American architectural history, a couple restore their 17th-century home in Ipswich. 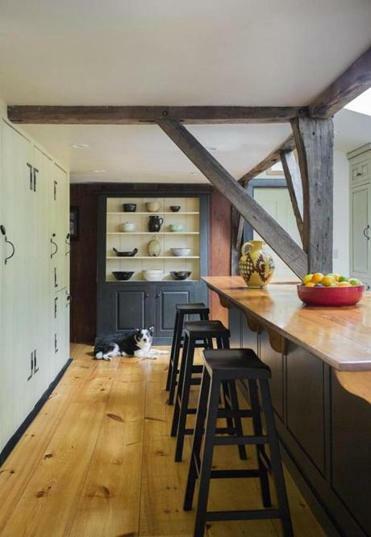 The kitchen has an island topped by re-purposed barn wood. AL BOYNTON AND KATHY BRUCE OF IPSWICH bought the 1686 Daniel Lummus House because it was a wreck. “It was abandoned. The house had no wiring or plumbing and was leaning forward because the summer beam had been removed,” says Bruce. “It was horrifying.” The couple had been house hunting, focusing their search on this North Shore town’s historic properties. First Period houses are the timber-framed dwellings built by the 17th-century settlers of the New World who relied on a medieval building style already out of fashion in the Old World. The First Period style was supplanted by the emergence of Georgian architecture at the beginning of the 18th century. Ipswich has 60 known First Period houses, this country’s largest concentration of our earliest architecture. 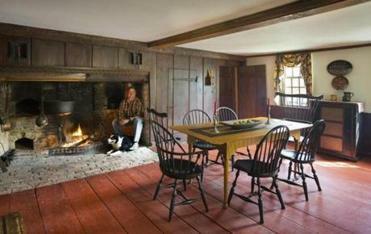 Before they bid on the Daniel Lummus House, the couple called on Ipswich architect and friend Mat Cummings, who learned that the 1686 structure had been significantly rebuilt in 1746. “That explains the Georgian paneling,” he says. Lummus, a housewright, owned the home at that time and did the renovation work himself. That was enough for Boynton and Bruce. With Cummings’s direction, they launched into a 1½-year restoration that put back the summer beam, straightened the house, and added a lean-to section. The new kitchen flows seamlessly into the ancient adjoining rooms, testament to the care with which Cummings and his clients approached their project. Boynton has spent the last three years building a new patio outside the kitchen door, as well as constructing stone walls. The community shares the couple’s enthusiasm; in 2012, the Town of Ipswich conferred the Mary P. Conley Preservation Award upon the Daniel Lummus House. Regina Cole is a writer in Gloucester. Send comments to magazine@globe.com.